Customer Success is the foundation of our growth. Here’s how we track and improve on it to keep growing. Much like “growth hacking,” “customer success” is one of those vague terms that seems like it was invented when we needed a buzzword to describe what successful businesses have been doing forever. 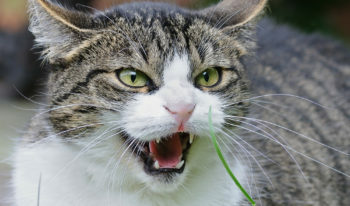 But just because it’s a buzzword doesn’t mean that it’s not absolutely critical to focus on. To head off a common misconception, when I say customer success, I’m not just talking about customer service or support. We believe deeply in customer support, and believe that one of the primary functions of a great customer support team is to ensure that customers are successful, but customer success – as a concept – is broader than that. We think of customer success as everything we do, from marketing to sales to onboarding to support to hiring to operations, that helps our customers get significant value out of Groove. I’ve seen a lot of different ways that companies track and measure customer success. Some of them very basic (just use Customer Lifetime Value), some of them quite complicated (10+ complex metrics pushed to a “customer success dashboard”). For our purposes, we’ve gotten a lot of value from a simple-ish approach that’s somewhere in the middle. 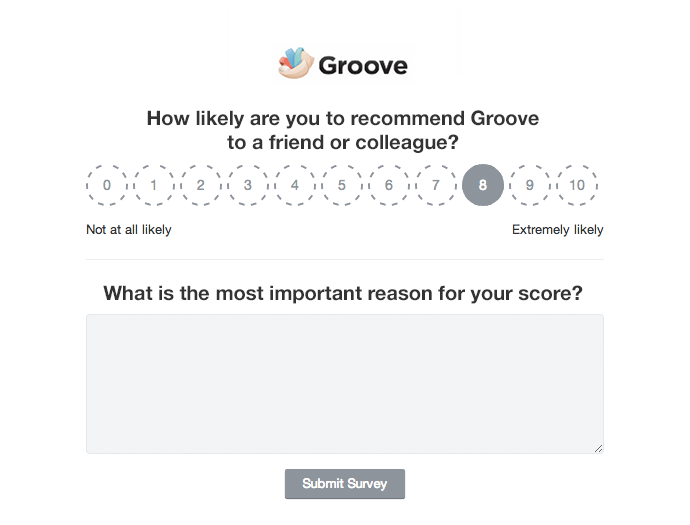 Below are the things we consider when we think about – and measure – customer success at Groove, along with some of our own metrics from some sample segments for each. The onboarding period is, for a business, perhaps the most critical time in a SaaS customer’s life. It’s during those initial sessions that the customer either “gets” the product and begins getting value from it, or they leave, usually forever. 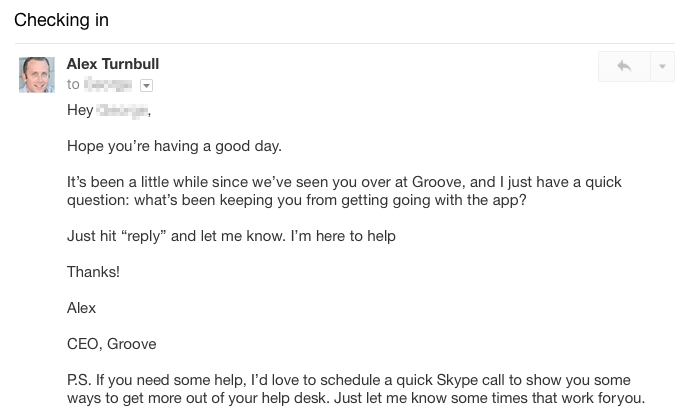 When a customer signs up for Groove, they get a series of onboarding prompts in their Groove inbox. Free users who complete the prompts within 24 hours are almost 80% more likely to convert to paid customers than those who don’t. 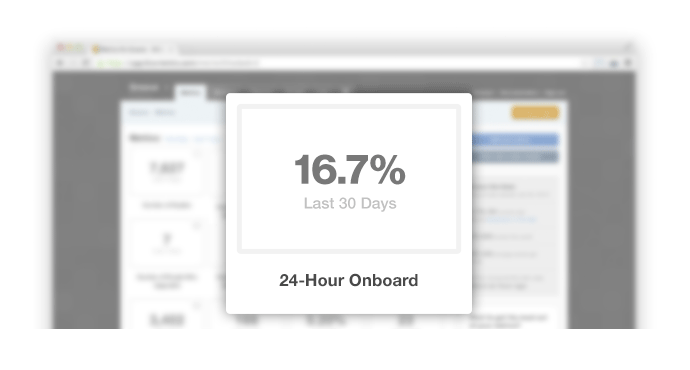 That’s a massive drop-off, and we use the 24-hour mark as a benchmark for early customer success. 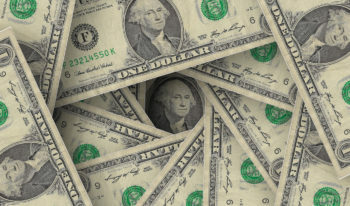 The next step in the customer lifecycle where we measure success is free-to-paid conversions. If a customer upgrades to a paid account, that’s an obvious indicator that they’ve gotten enough value out of the product that they feel it’s worth paying for. Beyond the initial month or so of a customer’s use of Groove, we track “sessions per day” as an ongoing customer success metric that indicates how engaged customers are with the product. The numbers here can swing pretty wildly depending on whether the customer is a full-time support rep or a higher-level manager or executive, but we like to see this number at least above “2”. Because of the nature of our product, we segment this metric in a few different ways, but I’d start with simply measuring it across all of your customers. One of the “traditional” customer success metrics, churn is an extremely important measure of the health of your business. If customers are leaving, then we’re not achieving customer success. It’s natural for some customers to churn, but we keep a close eye on this number; if it begins to creep higher, it means that something is up. We measure monthly customer churn, for which a simple formula is the number of customers who churned in a given month divided by the number of total customers at the end of that month. We measure our net promoter score once every quarter, and it’s the most important benchmark for customer sentiment and qualitative feedback that we use. An improving NPS score means that our app and business are performing better and becoming more valuable to our customers. There are a number of other huge benefits to NPS, including getting honest feedback to inform our product roadmap and giving us tangible goals to aim for each quarter, but it’s a really strong customer success metric too. By optimizing for customer success, you’re more than likely optimizing for growth. And if your revenue doesn’t grow along with your customer success metrics, then you’re probably doing something wrong (and need to re-visit pricing, operations, etc.). If you’ve never watched someone (who’s not on your team or a friend of yours) use your product, then you likely have user experience blind spots. While not the most scientifically sound experiment design, I’ve gotten a lot out of simply asking customers to take a few minutes to walk me through how they use Groove via screen share. It’s helped us identify points of friction and improve both the onboarding flow and the general UX. You can also use tools like Inspectlet to better understand user sessions and see where people are spending their time within your app. Last year, I set out to talk to every single Groove customer. It was one of the most time-consuming things I’ve ever done as a founder, and yet was also one of the best investments of my time. I still do it today, and likely always will. What I learned amazed me. 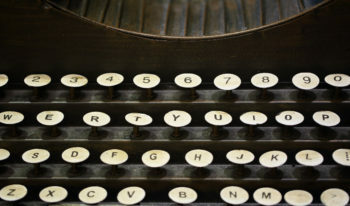 Not only did I better understand where people struggled and what we needed to do to increase retention and reduce churn, but we learned valuable insights about the words that are important to people. By understanding key words and phrases (for example, many customers asked about “filters”, whereas in Groove we call a similar feature “rules”), we were able to improve our onboarding flow to make more sense to our users. Excellent customer service really is one of the biggest driving forces behind customer success. If a customer is stuck, getting them unstuck in a way that not only satisfies them, but makes them excited to keep using the product is one of the most powerful things you can do to increase retention. That’s why I spend so much time doing support myself, and it’s why we proactively reach out to as many customers as we can to see how we can help. In addition to our one-on-one proactive support, we also automate some outgoing support emails based on what users do (or don’t do). 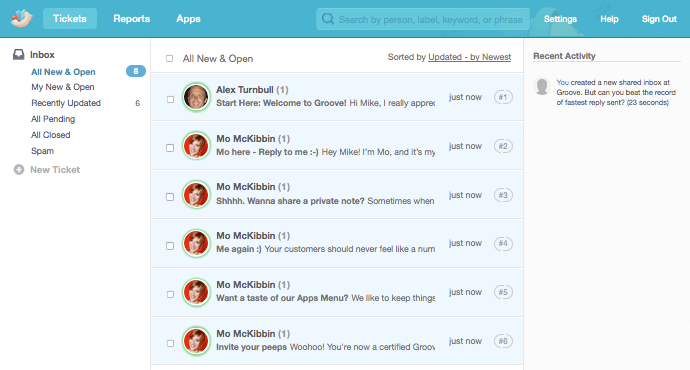 That email – and others like it – have brought back hundreds of users who, for one reason or another, hit a snag in their early days with Groove. Customer success metrics can vary based on the business, and the ones that are best for us might not be the best for you. But I hope that this glimpse into how we think about customer success inspires you to begin tracking it on your own, and gives you some ideas for how you can maximize success among your own customers.